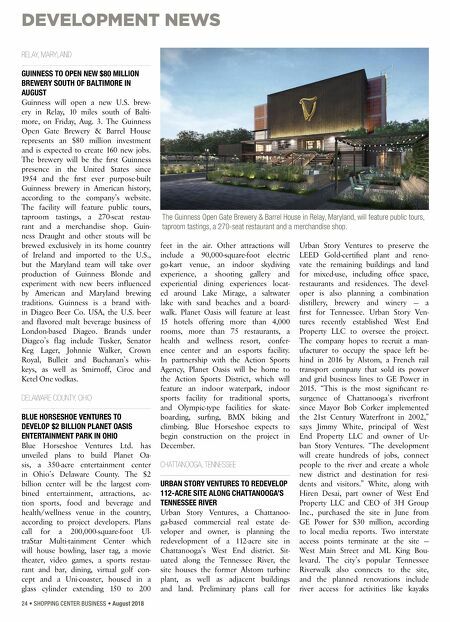 DEVELOPMENT NEWS 24 • SHOPPING CENTER BUSINESS • August 2018 RELAY, MARYLAND GUINNESS TO OPEN NEW $80 MILLION BREWERY SOUTH OF BALTIMORE IN AUGUST Guinness will open a new U.S. brew- ery in Relay, 10 miles south of Balti- more, on Friday, Aug. 3. The Guinness Open Gate Brewery & Barrel House represents an $80 million investment and is expected to create 160 new jobs. The brewery will be the first Guinness presence in the United States since 1954 and the first ever purpose-built Guinness brewery in American history, according to the company's website. The facility will feature public tours, taproom tastings, a 270-seat restau- rant and a merchandise shop. Guin- ness Draught and other stouts will be brewed exclusively in its home country of Ireland and imported to the U.S., but the Maryland team will take over production of Guinness Blonde and experiment with new beers influenced by American and Maryland brewing traditions. Guinness is a brand with- in Diageo Beer Co. USA, the U.S. beer and flavored malt beverage business of London-based Diageo. Brands under Diageo's flag include Tusker, Senator Keg Lager, Johnnie Walker, Crown Royal, Bulleit and Buchanan's whis- keys, as well as Smirnoff, Ciroc and Ketel One vodkas. DELAWARE COUNTY, OHIO BLUE HORSESHOE VENTURES TO DEVELOP $2 BILLION PLANET OASIS ENTERTAINMENT PARK IN OHIO Blue Horseshoe Ventures Ltd. has unveiled plans to build Planet Oa- sis, a 350-acre entertainment center in Ohio's Delaware County. The $2 billion center will be the largest com- bined entertainment, attractions, ac- tion sports, food and beverage and health/wellness venue in the country, according to project developers. Plans call for a 200,000-square-foot Ul- traStar Multi-tainment Center which will house bowling, laser tag, a movie theater, video games, a sports restau- rant and bar, dining, virtual golf con- cept and a Uni-coaster, housed in a glass cylinder extending 150 to 200 feet in the air. Other attractions will include a 90,000-square-foot electric go-kart venue, an indoor skydiving experience, a shooting gallery and experiential dining experiences locat- ed around Lake Mirage, a saltwater lake with sand beaches and a board- walk. Planet Oasis will feature at least 15 hotels offering more than 4,000 rooms, more than 75 restaurants, a health and wellness resort, confer- ence center and an e-sports facility. In partnership with the Action Sports Agency, Planet Oasis will be home to the Action Sports District, which will feature an indoor waterpark, indoor sports facility for traditional sports, and Olympic-type facilities for skate- boarding, surfing, BMX biking and climbing. Blue Horseshoe expects to begin construction on the project in December. CHATTANOOGA, TENNESSEE URBAN STORY VENTURES TO REDEVELOP 112-ACRE SITE ALONG CHATTANOOGA'S TENNESSEE RIVER Urban Story Ventures, a Chattanoo- ga-based commercial real estate de- veloper and owner, is planning the redevelopment of a 112-acre site in Chattanooga's West End district. Sit- uated along the Tennessee River, the site houses the former Alstom turbine plant, as well as adjacent buildings and land. Preliminary plans call for Urban Story Ventures to preserve the LEED Gold-certified plant and reno- vate the remaining buildings and land for mixed-use, including office space, restaurants and residences. The devel- oper is also planning a combination distillery, brewery and winery — a first for Tennessee. 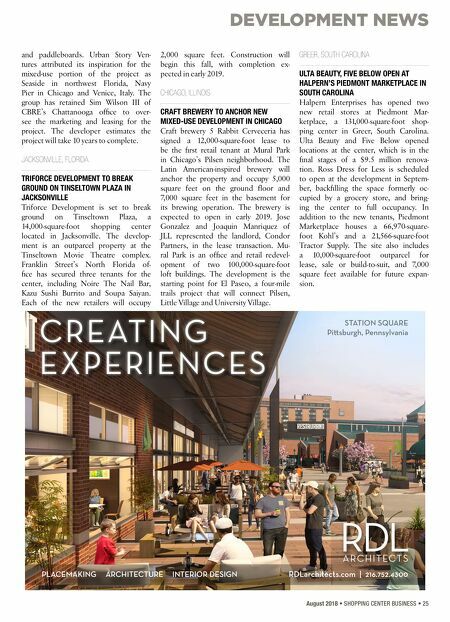 Urban Story Ven- tures recently established West End Property LLC to oversee the project. The company hopes to recruit a man- ufacturer to occupy the space left be- hind in 2016 by Alstom, a French rail transport company that sold its power and grid business lines to GE Power in 2015. "This is the most significant re- surgence of Chattanooga's riverfront since Mayor Bob Corker implemented the 21st Century Waterfront in 2002," says Jimmy White, principal of West End Property LLC and owner of Ur- ban Story Ventures. "The development will create hundreds of jobs, connect people to the river and create a whole new district and destination for resi- dents and visitors." White, along with Hiren Desai, part owner of West End Property LLC and CEO of 3H Group Inc., purchased the site in June from GE Power for $30 million, according to local media reports. Two interstate access points terminate at the site — West Main Street and ML King Bou- levard. The city's popular Tennessee Riverwalk also connects to the site, and the planned renovations include river access for activities like kayaks The Guinness Open Gate Brewery & Barrel House in Relay, Maryland, will feature public tours, taproom tastings, a 270-seat restaurant and a merchandise shop.